You might remember the beginning of Valiant Comics, when their first big titles were under the "Nintendo Comics System;" officially-licensed comic books featuring Super Mario, Captain N, The Legend of Zelda, and a few others. It was potentially a great opportunity to get original stories from games that deserved them, but the comics were essentially extensions of the TV cartoons -- obviously Captain N, but even Mario and Zelda took more elements from the shows than the games. That said, they were all better than you'd expect, with the Mario stories in particular being genuinely funny, sometimes even deadpan. Their four books continued apace for just one year, when Nintendo parted ways, and Valiant continued on with their original superhero titles. Meanwhile, Archie scored Sonic the Hedgehog, which is the longest-running video game comic in the Western world. One of Cryptozoic's strips is Xevious, which is pretty much my favorite Namco franchise, so I was drawn to this comic first. The setup is familiar: aliens are attacking Earth, starting with Peru (so far the only reference to the Nazca Lines in the game), but everything else about the story seems to take a sharp left turn. The hero is Oscar, nickname "Mu," a young guy from Argentina who joined the national air force to fight the Xevious (why not "Xevians?" They're aliens from the planet Xevious!). And apparently the Argentinian air force are the ones who fly the Solvalou ships. The first strip has a tongue-in-cheek air about it, or maybe that's just the utterly strange dialogue coming from Oscar. Regardless, that doesn't seem to be the actual intent once you keep reading. Oscar left his almost-fiance Eve to join the battle, but then discovers she joined up right after. How did he just now find out? Was she drafted really quickly? There isn't enough time and not enough panels to find out, because the next skirmishes are just around the corner. Despite some liberties in the characters and setting that make this comic look and sound like G.I. Joe plus emotions, it seems to be progressing towards something closer to the actual Xevious backstory, as Mu and Eve are both figures in the original "mythology" -- methinks I'm not the only one who's read the HG101 article. Sky Kid is one of the Udon strips, and is ostensibly the most faithful to the game, with its world of anthropomorphic birds in endless dogfighting combat. Humorously, the comic is tonally similar to Xevious, opening with serious introspection and touching flashbacks, and me once again not knowing exactly if I should be taking this seriously or not. Bravoman might be the "webcomic-est" of the whole lineup: it's kiddish and features jokey two-character dialogues with distressing regularity. It sits in between Sky Kid and Xevious in terms of faithfulness: Bravoman and the Alpha Man and Dr. Bomb and most everyone else in the game are here, but it doesn't follow anything else about it. What started out normally is now mostly just character introductions to familiarize people with Bravoman again. The comic feels like it's just playing with a toy box of characters, and that's probably because the writer had never heard of Bravoman before. My question is, will Pistol Daimyo show up? 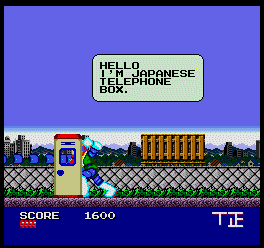 How about the talking telephone box? I mean, really, you guys should've given me a call. Alien Confidential is the other Cryptozoic strip, and is based on a Namco game that isn't even out yet -- an iOS game with a more serious look than the comics -- so I don't really have much to say about it. Essentially it's a slightly goofier version of Alien Nation with a little bit of Men in Black, told through flashbacks of a former alien-busting agent. It is the fastest-moving one of the lineup so far, though, with the flashbacks being mini-arcs of only a few parts each. They just don't seem to be tied together, though that could be the point. Artistically, there's nothing wrong with these comics: they're done by professionals who clearly know a thing or two about ink 'n' color (iffy dialogue aside, I like Xevious and its slight watercolor look the best), and are written with relative creative freedom -- all good starting terms for a tie-in. Is that freedom bad, though? I'm not entirely sure yet. Valiant's Nintendo comics were based on the cartoons more than the games, and when they had to get creative, it mostly worked out. And years before that, game comics had to get extra, uh, interpretive because the games had practically nothing to work from (that link is Galaxian, by the way). If ShiftyLook's comics simply run long enough to tell a story with a beginning, middle and end, that's fine. Rather, I think the immediate issue I have is with the concept of serialized, serious, short-form comics. Soapy superhero arcs are bad enough in the trades, but to have them portioned out daily in syndication is maddening, because more often than not you have days where absolutely nothing happens, or a tiny something happens and ends with a pregnant pause, and you have to wait at least 24 hours for the next one (48, in this case). Furthermore, not everything has to be serialized: Bravoman looks like it's meant to be a regular gag-a-day strip, but then it keeps introducing characters. And introducing, and introducing... It doesn't have to be Garfield, but Garfield was ready to go by strip two. Nevertheless, ShiftyLook stands out immediately because its comics are based on games that no one outside Japan would care about -- no better way to get attention from me, anyway -- and on the whole, that's kind of what's bad. While I can understand the creators wanting to introduce characters and slowly build up the story as weeks go on, they're still making comics about unappreciated games with stories where not enough happens on a regular basis. It's worth noting that the site launched alongside a few big Namco and Namco-related releases: Soul Calibur V, Tekken 3D, and Street Fighter X Tekken, any and all of which would have made perfectly fine serialized comics, and in Udon's case, would be right up their alley. Plus, if the site doesn't have ads or any other way to make money, then just what are they trying to accomplish? This is Namco we're talking about here; a company routinely criticized by their "fans" for doing more harm than good by overdoing DLC and making questionable sequels and reboots. Where and how do free webcomics fit? Well, to paraphrase ShiftyLook pre-launch, they want to re-expose these franchises with the possibility to expand them into other media, be it animation or even new games. And as another promotional image read, "No character is too obscure. No franchise is too dead. No husk is too decrepit. They can all be revived. Your voice will be heard." OK, well, I challlenge them to make a Phozon comic.